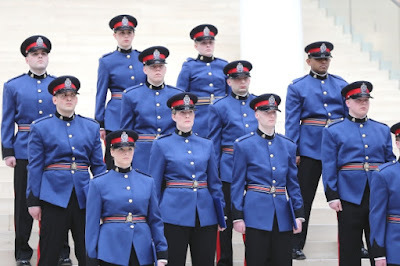 Members of the Edmonton Police Service Recruit Training Class 130 stand at attention during their graduation. A female constable in the Edmonton police, who worked out of downtown division, is suspected of leaking information to a Hells Angels associate. The officer is not in custody. In a media statement, police said the officer was arrested Thursday morning and has been relieved from duty without pay. Few details have been released.